A close up of Caparisoned Tusker at Paramekkavu Temple. Adhering to the medieval Peruvanam tradition, the festival is confined to the temples of Devi (goddess) and Sastha (divine combination of Shiva and Vishnu). 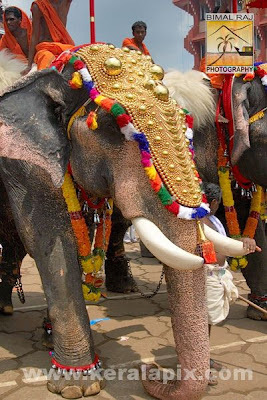 Ten deities from the neighboring temples pay obeisance to the presiding deiety of Thrissur and only spectator of the Pooram events, Lord Siva at the Sree Vadakkunnathan temple, situated in the heart of the town.